This nature retreat lets you escape into the wild landscapes of Maharashtra, while maintaining the basic comforts, so that you can enjoy your precious weekend. It's the perfect introduction for someone who hasn’t been camping before, but wants to try it out. Your campsite is perfectly situated on the banks of Lake Andhra, with a forest behind it, and views of a waterfall too. You'll be able to try your hand at a host of adventure activities like rock-climbing, rappelling, rope course and more (all payable on the spot, and not included in this package), or you can choose to go for a peaceful ramble on your own and reconnect with nature. The campsite is set close to a small village of Kambre, with the rolling Sahyadris in the background, and the lake in front. You'll stay in spacious tents with attached washrooms, cots with comfortable clean bedding, as well as insect nets and basic furniture. You'll also have towels, electrical points, hot water and clean, filtered drinking water for your comfort. • Experience nature at its pristine best. 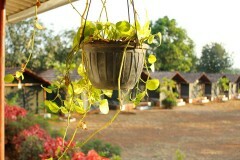 • Spend two days with scenic views of countryside Maharashtra. • Get away from the city for a relaxed, nature-rich holiday. Adventure camping at Kambre is a non-strenuous activity that is suitable for everyone. However, if you suffer from any pre-existing medical conditions, please check with your personal physician before booking this trip. For cancellations made more than 45 days before check-in date of the Kambre camping trip: 100% refund. For cancellations made 30-45 days before check-in date of the Kambre camping trip: 75% refund. For cancellations made 15-29 days before check-in date of the Kambre camping trip: 50% refund. For cancellations made less than 15 days before check-in date of the Kambre camping trip: no refund. Check-in time at the campsite is 11:30 hrs, while check-out time at the campsite is 10:30 hrs. The tour operator reserves the right to alter or cancel the itinerary of the Kambre camping trip to maximize the safety of travellers and staff. Any costs arising due to such a change in the itinerary are borne by the traveller. No pick-up is for this Kambre camping trip. No drop-off is for this Kambre camping trip. Day 1 of adventure camping at Kambre: Check-in and enjoy! Arrive at the campsite at any time after 11:30 hrs. You'll be escorted to your rooms, where you can freshen up and head out for lunch. In the afternoon, you can take a walk around the campsite or visit the beautiful waterfall. You can also choose any of the activities that the camp has to offer such as archery, rifle shooting, rock climbing or take up a rope course, all booked at an additional cost. 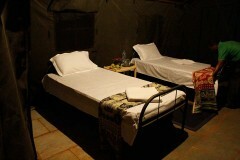 Alternatively, you can also opt for a trek, where you can camp in the forest, pitch your own tent and make your food. Overnight in tents at the Kambre campsite. Wake up early, so you have time to pack up, and dig in to your delicious breakfast before you depart from the campsite. Check-out time is 10:30 hrs. Your Kambre adventure trip ends here. Check-in time at the campsite is 11:30 hrs. You'll be staying in large tents, which are equipped with an attached washroom, cots with all bedding, basic furniture, towels, and electrical charging points. Hot water and Aquaguard filtered drinking water are available at the campsite. You'll be served buffet lunch and dinner at the common dining area. You'll be served buffet breakfast at the common dining area. Check-out time at the campsite is 10:30 hrs. 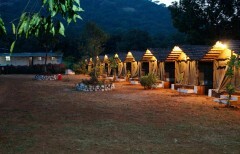 The campsite is located on the old Mumbai-Pune highway. It is at a distance of 100-km/3-hr drive away from Mumbai and 130-km/3-hr drive away from Pune.